ï»¿ Count Text: Count Characters, Words, Sentences, Lines, Word Frequency. Live Word ,Paragraph Counting - Online Paragraph, Word Counter. Online - Live Word Counting ,Word Counter. Online - Live Word Counting ,Paragraph Word Counter. SMS Characters ,SMS Words ,SMS Paragraphs Counter,Free SMS length calculator. 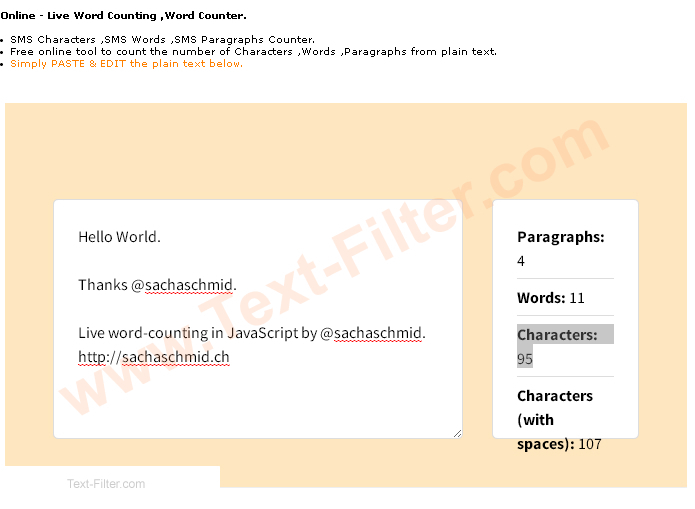 Free online tool to count the number of Characters ,Words ,Paragraphs from plain text. Simply PASTE & EDIT the plain text below.